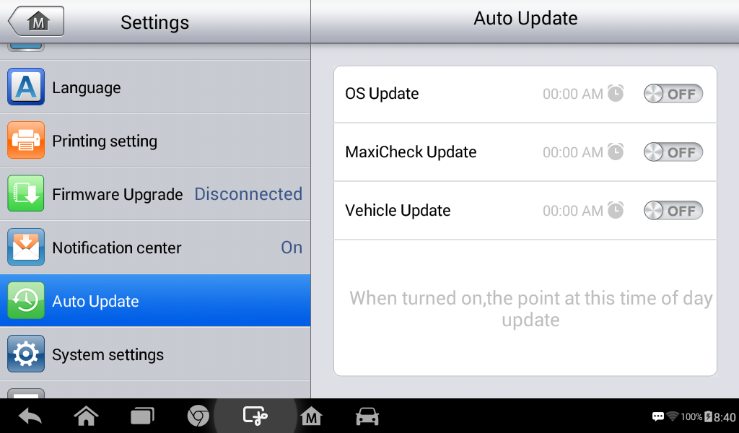 The Auto Update allows the Autel Maxidas DS808 to automatically update the OS, the MaxiDAS system, and the Vehicle. 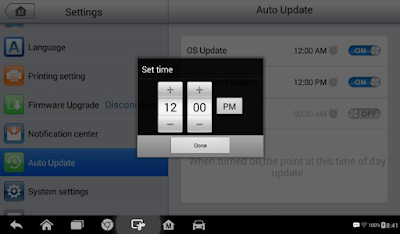 All you need to do is to switch ON by tapping the button on the right side of each and set the desired automatic update time.To set auto system or vehicle update1. Tap the Settings application on the MaxiDAS Job Menu.car tool2. Tap the Auto Update option on the left column. The three auto update items list on the right. 3. Switch the ON the button on the right of item that you want to auto update.4. Tap on the time to set time, you can use the + and – button or tap on the numbers then the manual input screen will pop up. Tap Done to complete the time setting. Autel MaxiDiag MD808 Pro to Perform Vehicle Diagnosis? What Would you Find out about MS908CV ? How to Replace Battery for Autel PowerScan PS100?